Around September 2016, Autumn Macarthur and I began brainstorming a new multi-author series. We were surprised at how quickly the stories’ ideas came, and pretty soon we had a solid outline for what we envisaged. We set about asking the authors we wished to collaborate with on this series and were ecstatic to quickly get Elizabeth Maddrey, Alexa Verda, Clare Revell, Heather Gray, and Narelle Atkins on board. What we had in mind was unlike other multi-author series we’d seen, however, as this series wouldn’t be joined by theme or storyworld (although there is a storyworld common to all the characters and some of the books). Our plan was to join the series by the characters and a thread of intrigue that would weave its way through the books, the answers only finally revealing themselves in the last story. We’ve a myriad of wonderful characters for our readers…characters that we’ve come to know and love as each of us have written our stories and swopped ideas of how this character would speak, or dress, or eat, or act. Not only did we need to know or own characters, we needed to know the main characters in other authors’ books too. As you can imagine, this has taken some keeping track of. Google docs spreadsheets we can all update as we go, website links, photos, and back and forth messages and emails. But oh, it’s been fun! And the closer we get to D-Day, the more excited we become about this series. There are incredible heroes and heroines waiting to take you on their journeys into love, intrigue, and healing in A Tuscan Legacy. The Rossi cousins who grew up in Italy are lawyer Rafaele, firefighter Ric, schoolteacher Sienna, and tour guide Alessandra (although she prefers to be called Alessa). Their American cousins, the Carters, are pizzeria executive Marco and his twin brothers, Nicolo (although only his Nonna can call him that) and Piero. Nick’s a piano-tuner, and Piero a fashion photographer who travels the world. Rachel Golding is the illegitimate cousin they discover. And then there’s their ever-imposing Nonna—the matriarch of their family—Isabella Rossi. The characters come to you with unmet dreams, suspicions, secrets, heartbreak, and deep family hurts and scars. Travel to three continents in A Tuscan Legacy—Europe and England, Australia, America—and places like Tuscany, Rome, Reading near London, Wales, Sydney, Texas, Washington DC, and anywhere that world-traveller Piero finds himself. 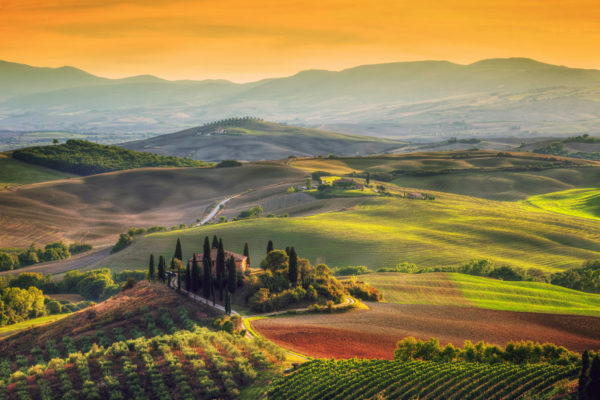 Start your journey to Tuscany this summer with Book 1, That’s Amore. 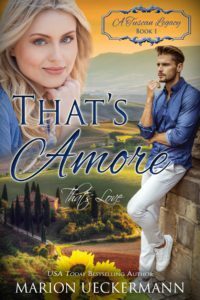 If you’ve read my Seven Suitors for Seven Sisters series, you’ll discover the heroine of That’s Amore appeared in Books 1 and 5, and hero Rafaele was mentioned in Book 2. And while you’re waiting, please visit and like our Facebook page so you don’t miss out on anything happening there as we ramp up to launch. Soon we will have our website up and running and we’ll post the link to that on the Facebook page. Eight grandchildren – one legacy! 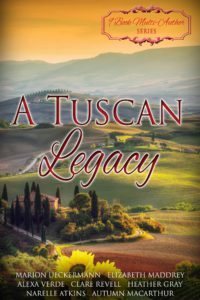 When Isabella Rossi invites each of her adult grandchildren to her estate in the Tuscan hills for her eightieth birthday, she hopes to reunite a family fractured by distance, death, and secrets. The birthday gift of a painting, arriving unsigned and with no sender’s details, rips open old heartbreak. One family secret has already been revealed, her youngest son Albertino’s illegitimate English daughter. Now it seems there could be yet more secrets. Hi. Marion! Delightful intriguing international series! So looking forward to this series. I liked the Facebook page. Thanks for releasing a book a week. As a reader I enjoy that pace, rather than a book a day or having the books all released at once. The video definitely has my attention. Well done and blessings to a group of inspiring authors. Thanks, Renate. We cannot wait to release this series. It’s been really exciting working on it. Hi Kathy, we’re excited too! We will be marketing the set more intensely as we get closer to the release dates. Why not like our Facebook page and you’ll be notified when we post there. Our website will go live as soon as we feel it’s ready enough to show the world and the final release dates will be on the Books landing page. I’m sure there will be more Inspy posts as well the closer we get to the first release. Glad that you’re excited about this series. This sounds awesome! I am 100% Italian with a huge family and cannot wait to read these! Thank you, Susan. We have loved working on this project. Hi Marion! I’m so excited for April. These are going to be amazing! Love the book trailer! I definitely want to read this story. Thank you. Watch our Facebook page for updates. We can’t wait to bring these stories to our readers. wow what a fun idea you all had. the video really wants a person to check this out. I look forward to this coming out. Thank you, Lori! I loved the job Marion did with the video. This series sounds amazing. The scenery you’re using is gorgeous! I’m looking forward to April. Very cool! I’m looking forward to reading this series. So excited to be part of A Tuscan Legacy! Huge thanks to Marion and Autumn for creating the series and inviting me. And it’s been so much fun working together with Marion, Autumn, Elizabeth, Clare, Heather, and Narelle. Marion, this sounds absolutely incredible. I love your graphics and your video. I wish I could figure out how you get through so much! You’re amazing. OOOHHHHH I love it already! I can’t wait to read this! It’s going to be great! This sounds wonderful! I “liked” the FB page…..I am really excited to hear more! Thanks, Jackie. Glad you love it. We’ll soon have the website up and running. Watch the FB page for more info. Sounds like an intriguing book series I’ll be looking forward to reading. Will the series possibly be offered under Amazon’s Kindle Unlimited program? Hi Esther, yes, A Tuscan Legacy will be enrolled in the KU programme. We also plan to publish in print, too, for those who like paper. We look forward to you reading our books. WOW! I’m almost giddy with excitement! I CAN’T wait to read these! When I told my husband about this, he said you are a marketing genius! LOL! Love these authors. Love this collection, and I haven’t even read it! I love the premise. So fun! And the covers are beautiful. I’m so excited about this series. It’s been such a God-thing right from the start! I love love LOVE the amazing work Marion did for the covers and the video – and as you’ll discover in April her story in Book 1 is even better! I’ve written a few continuity series books and they are so much fun. This series sounds wonderful! Thanks, Deb. We really enjoyed watching the story and characters evolve. Amazing! I am so excited to hear this…….My favorite authors, too! Thanks for another wonderful set of books to look forward to. Congratulations on the video and the cover. It’s awesome! As, thanks Mattie, and it has been our absolute pleasure to put these books together for our readers. Lol and that first word should be aw…silly autocorrect on my phone. I absolutely loved reading the comments! Thank you so much for your wonderful words about the series. Now I’m even more excited! Just “met” some of these authors through recent box sets … so looking forward to this! Wonderful, Jenni. So glad you found us. This series is going to be awesome! I would like to find out more about these books. They sound really good. Our website will be up in couple of weeks, Andrea. You can follow us on our Facebook page in the meantime. Mystery and Romance together. My favorite type of story to read in a book. We have had so much fun bringing mystery and romance together, Janet.